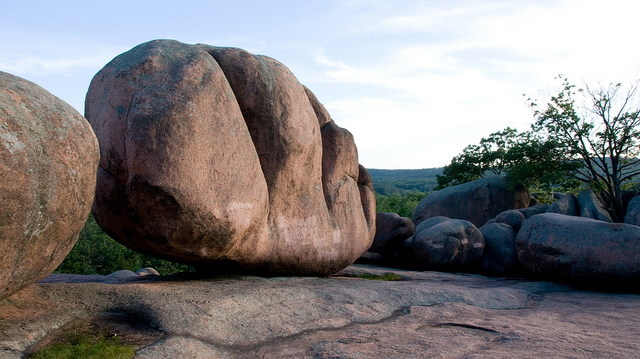 I’ve talked about it for years, suggesting it as a weekend destination to my kids … Elephant Rocks State Park, that is. I’ll admit it was a hard-sell to them; “What’s so great about a bunch of giant rocks?” they’d ask. “These are enormous, prehistoric giant rocks,” I explained to them on more than one occasion. Finally the decision was made, parents overruled the kids, we loaded up the family and made a Sunday trip out of it. Comfortable clothes and tennis shoes for everyone! These aren't your ordinary rocks, nor your ordinary view. Two and a half hours later, with a brief stop for lunch in nearby Potosi, we arrived at Elephant Rocks State Park, near Ironton, on a picture-perfect, blue-sky Sunday afternoon. The parking lot was almost full. With the car doors barely open, our 16-year-old son, an outdoors type of kid, was off and running, climbing the rocks. Keep in mind these are the rocks to the side of the parking lot, which are amazing enough, “But wait,” I yelled as the rest of us were still climbing out of the car. We explored the rocks off to the side, making our way to the top of the hill of rocks, finding the quarry overlook, and taking in the amazing scenery. 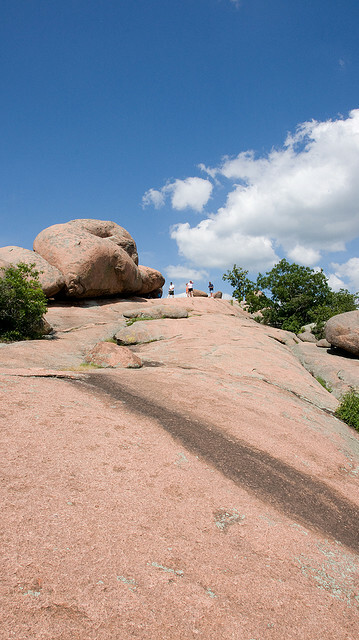 We wandered back to our starting point, and headed up the paved trail to the Elephant Rocks. Nothing can really prepare you for the sight of these enormous rocks, up close and personal. “Awesome” and “wow” are words that come to mind. Our son was off again, climbing these giant rocks. Standing next to these giant rocks, we were awestruck at the sheer massiveness. Eventually we left the giant Elephant Rocks, continued to meander along the path, making our way back to our car. We grabbed some snacks from the car and settled into the shade nearby, and gave ourselves a little break. Well, most of us; you guessed it, our son was still off climbing rocks nearby. Soon after, we headed home. It was a great day, summed up by our son who said it was the coolest place we’ve EVER been. Written by Suzy Schneider, executive assistant to the Missouri Tourism Commission (and mother of two teenagers).